I’ll be back later this week with some photos from our vacation and that Bloody Mary recipe I promised, but first I thought you might enjoy the video we made during our shark infested dive on the Aeolus last week. Aeolus 8.8.12 from Elena Rosemond-Hoerr on Vimeo. Tonight after the last water ballet performance we hop in the car and drive south. The car packed, our phones loaded with music and audio books for the ride, and a tiramisu made by the man who claims to have invented tiramisu chilling in the freezer bag, we are ready to hit the road. To say this week in Morehead is eagerly anticipated would be the understatement of the century. For most of the week it’ll just be Dan, myself, and Paps. Ryan and his girlfriend Erin will drop by earlier in the week, and I’m hoping my sister Lauren and my stepmom will come later in the week. But mostly I’m looking forward to a week of reading, diving, relaxing, swimming, and running. And, of course, sitting on the porch, looking at the marsh, and drinking bloody marys. Which is exactly why, in addition to making a big batch of bloody mary mix, I pickled green beans and carrots. Because nothing is better than a bloody mary full of pickled green beans, okra, carrots, and garlic. And nothing is better than drinking a chunky bloody mary full of pickles while sitting on the porch watching the egrets fly by. Begin by sterilizing your jars. About an hour before you want to can fill two large pots with water. I recommend that you have some canning equipment, at the very least a large pot with a rack and a pair of tongs. You’ll need a separate pot for sterilizing your jars and lids. Bring both pots of water to a boil. In one pot (the one without a lid) place your jars and the lids (not the screw bands). Allow them to boil for at least 10 minutes, but keep them in the pot until right before you fill them. In a non reactive sauce pan heat vinegar, water, and salt. 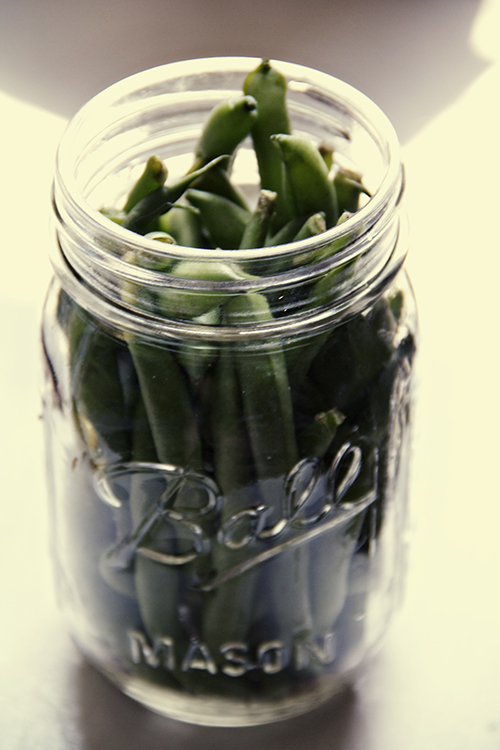 Clean the green beans, but leave them whole. In each sterilized jar, place two cloves of garlic, 1 tbsp red pepper flakes, 1 tsp mustard seeds, 1 tsp cumin seeds, and as many green beans as you can pack in tightly. Ladle vinegar mixture into each jar, leaving about 1/4″ headspace. Wipe the rim down, place a clean lid on each jar, and screw band on tightly. Process in your large pot (with rack) for 10 minutes. Remove from water, give the band another squeeze, and allow to sit. Once the jars have sealed (you’ll know if you can’t pop the lid up and down), set them in a cool, dark place for at least two weeks. They will stay for up to a year. 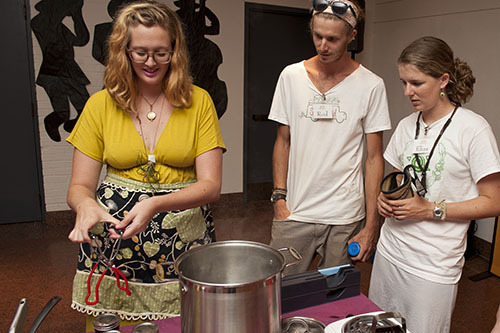 Last month when Sol Food was in town the Museum had a community day focused around food, sustainability, gardening, cooking, and living. 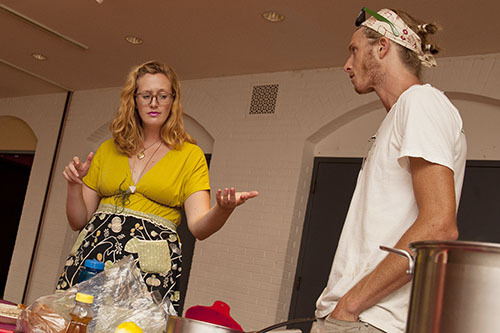 In addition to the workshops Sol Food held on the bus and the vigorous butter making happening on the other end of the lobby, I held a jam-making workshop for anyone who was interested. Berry jam, made without pectin or sugar added, is as simple as three ingredients, a bit of time, and patience. Whole blueberries combine with big chunks of strawberries and the juice of a few lemons, and simmer for a half an hour, or until they’re nice and syrupy. Then they quickly go into sanitized jars and get plopped into a water bath, ready to be enjoyed at your leisure. 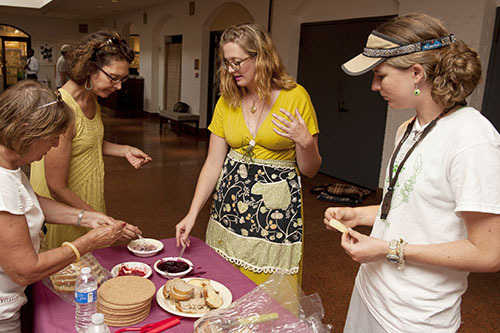 I made enough jam that day for 6 1/2 pint jars- two went on with Sol Food and the rest went home with excited Museum guests. And there was just enough left over for a bit of sampling. Jam, it turns out, is the perfect compliment to homemade butter. 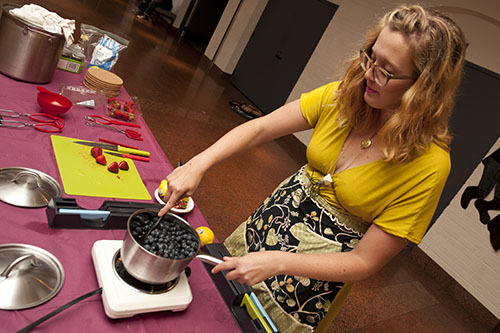 In a large, non-reactive pot combine whole blueberries and quartered strawberries over medium heat. 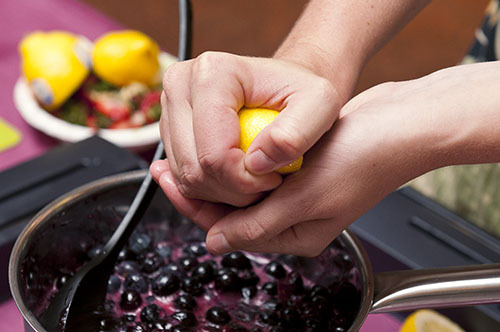 Allow to simmer, stirring occasionally, until the juices are thick the the chunks of fruit have broken down. Stir in juice from lemons. About an hour before you want to can fill two large pots with water. 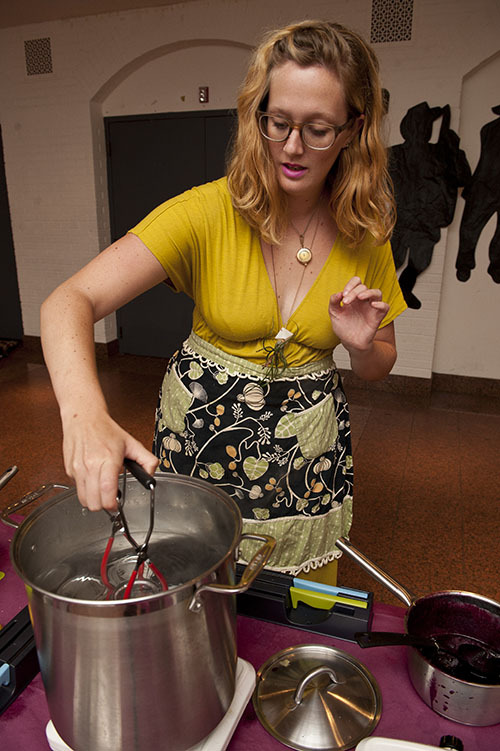 I recommend that you have some canning equipment, at the very least a large pot with a rack and a pair of tongs. You’ll need a separate pot for sterilizing your jars and lids. Bring both pots of water to a boil. In one pot (the one without a lid) place your jars and the lids (not the screw bands). Allow them to boil for at least 10 minutes, but keep them in the pot until right before you fill them. 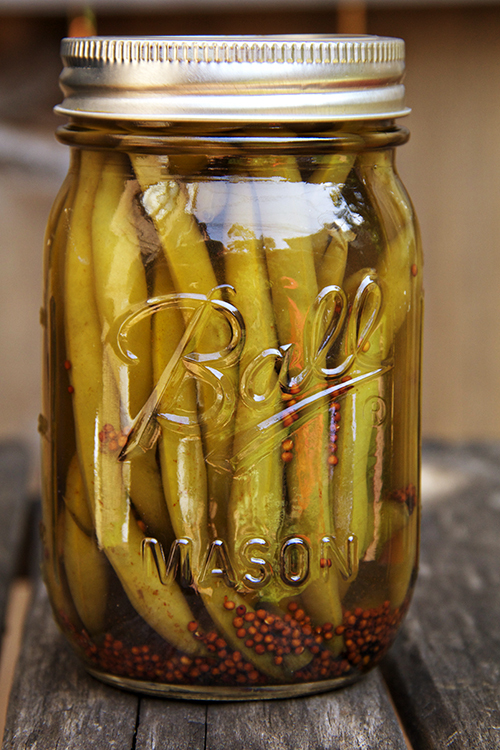 Use a spoon to fill the jars, leaving 1/4″ of room at the top. Use a spoon to make sure there are no bubbles in the jar, and adjust the headspace (space between the jam and the top of the jar) as needed. Wipe the rim with a sterile cloth and fish a lid out of the pot. Place the lid onto the jar and screw the band on tightly. Set aside and repeat with all of your jars. Take the rack from the other pot and place the jars onto it. Lower the rack into the pot (whose water should be boiling) and process the jars for 10 minutes. Remove them from the water and (here’s the hardest part) wait for the ping. When they first come out of the water the jar should pop up and down, but when the jars seals you won’t be able to pop the jar any more. Some jars will seal immediately, some will take a little longer, and some may not at all. 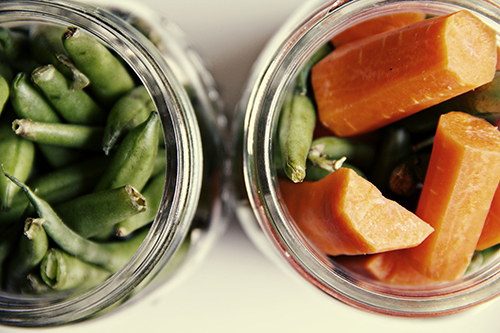 If jars fail to seal, store them in the fridge for up to two weeks. The jars that do seal, however, are good in a cool dark space for up to a year. Enjoy!